La alineación original de Marshall Tucker Band, formada en 1972, incluía al guitarrista, vocalista y compositor Toy Caldwell (1947–1993), el vocalista Doug Gray, el teclista y flautista Jerry Eubanks, el guitarrista George McCorkle, el baterista Paul Riddle y el bajista Tommy Caldwell. Firmaron por Capricorn Records y en 1973 lanzaron su primer álbum de estudio, titulado The Marshall Tucker Band. 1979 Running Like the Wind 30 — — — Warner Bros.
↑ The Marshall Tucker Band – Biography (enlace roto disponible en Internet Archive; véase el historial y la última versión).. 2009. ↑ Colin Larkin (ed. 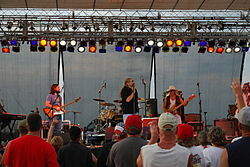 ), "Marshall Tucker Band." The Encyclopedia of Popular Music, Vol. 5, (New York: Oxford University Press, 2006), pp. 521–522. ↑ Ted Olson, "Marshall Tucker Band." The Encyclopedia of Country Music: The Ultimate Guide to the Music (New York: Oxford University Press, 1998), pp. 325–326.